So you’ve decided to visit a car storage facility, but you’re unsure what to look for? Many companies may not display signage at the facility for security reasons. If you get lost trying to find them, simply call them. Companies who take an interest in you will be more than willing to help. Site security is more important than ease of locating them for the first time. Once you’ve been there you should recognise where they are on a return visit. A professional company will ensure that every reasonable effort has been made to secure the facility. Strong doors on personnel entrances, raising bollards in main door entrances, fire and intruder alarms should all be standard. Ask if the company has an insurance policy for vehicles in their care, some will and some will not. Those that do are perhaps taking their responsibility of looking after your pride and joy a little more seriously? What is the storage environment like? The storage facility should appear clean and well cared for. This will reflect how your car may be cared for. If it looks good, it usually means it is good. There should be no gaps around the building to prevent moisture or rodents potentially entering the building. The presence of dehumidifiers will indicate that the environment will remain dry and maintained. If the unit is not dehumidified, moisture in the air could damage your car whilst in storage, an especially strong consideration for those requiring long term car storage. Moisture in the air forms condensation on warmer objects than the surrounding air as air temperature cools at night. This condensation will over time lead to rusting and mould formation. A controlled environment will ensure these are minimised, prolonging the life of your car. Look for painted concrete floors. Floor paint will seal the floor, preventing moisture rising from the ground beneath. The paint will also result in a smart, dust free environment for your car. Are the buildings and forecourt clean or is there a muddy farmyard to navigate your way through? This again will give you an idea of how your car may be cared for once you have left it in the hands of your chosen company. Do they have the correct equipment to care for your car? Does the car storage company look like they’re organised and have systems in place to enable them to work efficiently? This should give you reassurance that your car is in safe hands. Cars should be covered with specialist covers. Cotton dust sheets will absorb moisture and allow dust particles to settle on your car. Polythene dust sheets, on the other hand, will not allow air to circulate around the bodywork of the car and may lead to condensation. Both types of covers should be avoided in favour of a specialist, breathable cover. Ask if a car chamber or car bubble is also available. Automatic battery conditioners should be connected to every car. One shared between two cars or more simply means that batteries may be left to go flat if overlooked. A flat battery will result in damage to the batteries internals and ability to maintain charge over a long period of time. Proper equipment and care should mean that the staff are conscientious in their approach to daily tasks; caring for your car. Enquire as to what protocols and precautions are used to care for the cars in the facility. This should reassure you that all eventualities have been considered to offer your vehicle a ‘best practice’ approach. Do the cars in storage appear of similar type and value to your car? Cars of similar value to yours will reassure you that the company you are viewing has the necessary experience to look after your pride and joy with the utmost care. 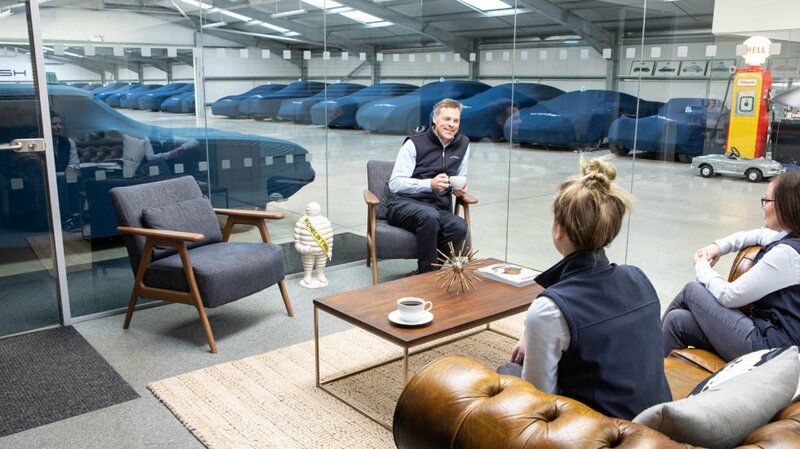 For example if you see the company looks after a lot of classic cars, it’s more than likely it’s for good reason, and they have the required expertise and hopefully the passion too, for effective and reliable classic car storage. Cars stored with plenty of space around them and in an orderly fashion are more likely to be regularly monitored and maintained than cars squeezed into a building. What are the people operating the business like? Ask if they have their own cars on site, in storage, they may have built or restored a car. The majority of people will and their enthusiasm may shine when asked giving you reassurance. They may see classic car storage as more of a passion through the love of classic cars, rather than just a job for example. Ask if the staff have a trusted network of trade contacts enabling additional services to be offered towards your vehicle whilst in their care. Most owners and operators of car storage business may live on site. An alarm activated at any hour is likely to receive more attention than if they live off site. This will also make for more flexible appointment times but remember – they may have a life too!